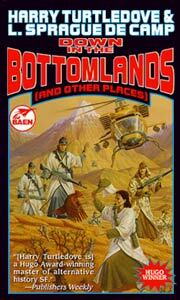 "Down in the Bottomlands". In Down in the Bottomlands and Other Places . Baen 1999. Turtledove, Harry. "Down in the Bottomlands"
What if: The Mediterranean basin never opened to the ocean. Summary: In modern days, a murder during a tour of the Bottomlands Trench reveals a plot to destroy the "Gibraltar" mountains with a nuclear weapon. Published: In Analog , January 1993; The New Hugo Winners, Volume IV (ed. Gregory Benford), Baen 1997 (0671878522w88 android); Down in the Bottomlands and Other Places (with L. Sprague de Camp), Baen 1999 (0671578359BUY); amd We Install: And Other Stories , Open Road Media 2015 (1504009428BUY). Translation: Italian by Enzo Verrengia as "Laggiù nelle Terrefonde", in Isaac Asimov SF Magazine [[date unknown]]; Analog Fantascienza 3 , Phoenix Enterprise 1995; I Premi Hugo: 1991-1994 (ed. Piergiorgio Nicolazzini), Nord 1995. Translation: Spanish by Claudia de Bella as "En las tierras del fondo", in Axxón #66. Awards: Winner: 1994 Hugo for best novella.